Toyota Motor Corp. President Akio Toyoda, left, and Masamichi Kogai, president of Mazda Motor Corp., shake hands in May 2015 after the two companies agreed to broaden ties and share technologies, potentially including new projects on fuel efficiency and safety. DALLAS -- Toyota plans to build a C $2 billion (US $1.6 billion) U.S. plant in a joint venture with smaller Japanese rival Mazda to assemble Toyota compact cars and Mazda crossovers. 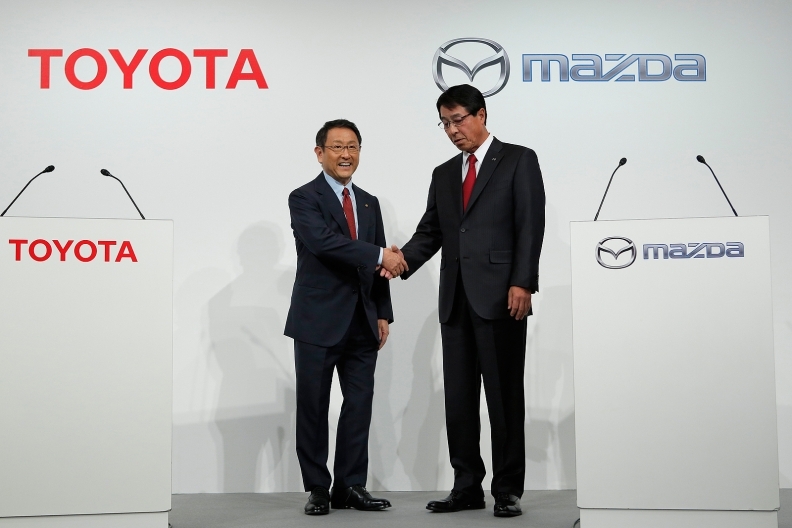 The joint venture is part of a wider agreement that calls for Toyota and Mazda to acquire stakes in one another. The companies detailed the agreement at a press conference earlier Friday. Toyota will produce the Corolla at the new U.S. plant, but it's unclear what type of crossover Mazda will assemble. The plant, slated to begin production in 2021, will likely put the two automakers in the good graces of President Donald Trump, who has criticized Toyota for building a car factory in Mexico rather than adding another U.S. plant. A new U.S. plant is serious news just weeks before North American Free Trade Agreement talks are set to begin in Washington, D.C. Since NAFTA came into effect in 1994, four assembly plants in Canada and 10 in the United States have closed; eight new plants have opened in Mexico. President Trump has threatened automakers with tariffs on new vehicles crossing the border from Mexico, although that would require an exit from NAFTA, which is being renegotiated by the United States, Mexico and Canada. "It's kind of a win-win for both of us," Lentz told Automotive News. "They [Mazda] get production in the United States and I get another 150,000 vehicles and I get them for a relative bargain in the marketplace," he said in reference to the US $800 million that Toyota will invest in the 50-50 joint venture. The additional U.S. factory capacity will allow Toyota to re-jig production at North American plants that will allow it, among other goals, to produce more pickup trucks. Mazda produces small cars for Toyota at a plant in Guanajuato, Mexico, in a deal that goes back to 2015. Those cars are the Yaris iA sedan, based on a Mazda vehicle, and Toyota's own Yaris hatchback. They form the backbone of Toyota's subcompact offerings in the United States.